This article is intended to help the user understand dependencies, and how they are used in Catalio. Dependencies are used to describe how a Use Case has been or plans to be developed. Say you have a Use Case that talks about a Sales Representative adding a contact into Salesforce. One of the requirements or scenarios is to have the Company field required. To achieve this, you decide to use a validation rule. You can add this dependency to your Use Case, so that every knows how this Use Case was developed and how it can be tested. This is just one way we plan to use Dependencies! In Salesforce tracking dependencies becomes a pain, where are components used? What effect will removing a component have? It becomes very difficult when you are working with hundreds, maybe even thousands of components where removing a dependency can cause errors all over your org. In Catalio we have introduced a feature to help you manage this problem and right now the feature is pretty bare-bones, but it is a good step in the right direction to where we want to go with this feature. Another purpose of Dependencies is to better help teams manage what is used where, and that makes it easier for teams manage what is and is not used anymore, allowing for easier cleanup. Imagine a day were Catalio could tell you to consolidate three process builders into one, or that a certain validation rule is duplicated and can be deleted! 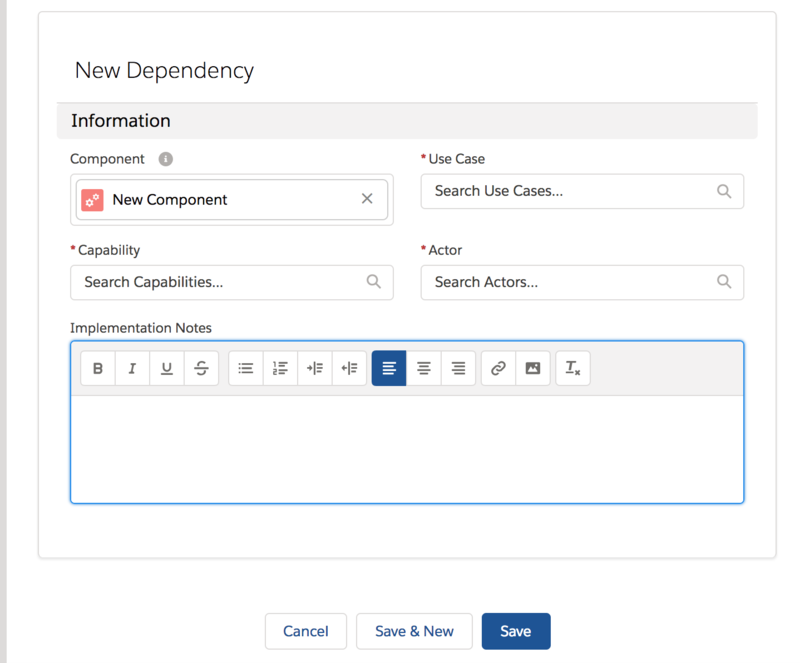 In Catalio after our job has synced with your Salesforce Org, you will be able to create Dependencies for that Component or add them to an existing Use Case. A Dependency will be able to link a Component to a Use Case, and it will also be able to have a capability and an Actor. Dependencies also have implementation notes. We have a lot more plans for Dependencies, but hopefully for now they can help you document your Use Cases and see how your Salesforce Org is being used.